We have a hell of a 62nd episode coming up for you on October 1st. Lace up your disco skates and powder your nose, because nothing goes better with a little Funk than a whole lot of Glitter & Mayhem! The first half of our wild and crazy program will feature Noël Jones, Holly McDowell, and Order of Odd-Fish author James Kennedy. Since this is the guy who once challenged Neil Gaiman to a fight for the Newbery Medal, anything could happenand probably will! Then the second half of our dance card will be filled up with authors and editors from the new, Kickstarter-funded, speculative nightclub anthology Glitter & Mayhem! Maurice Broaddus, Kyle S. Johnson, William Shunn, and Laura Chavoen will be on hand for a multimedia spectacle bringing all the fabulous madness and debauchery of classic clubland to life. Throw in one of our patented Poems by Bill, a fistful of Haiku by Andrew, and your pick of cold beers from around the world, and you've got all the ingredients for a night you might regretif you can even remember it the next morning. The needle drops at 7:30 pm on Tuesday, October 1st, 2013, with your DJs D-Billy and Huffmaster, in the upstairs lounge at Hopleaf, 5148 N. Clark St., Chicago. We start seating at 7:00 pm and no earlier. Admission is always free, but you must be 21 or older. 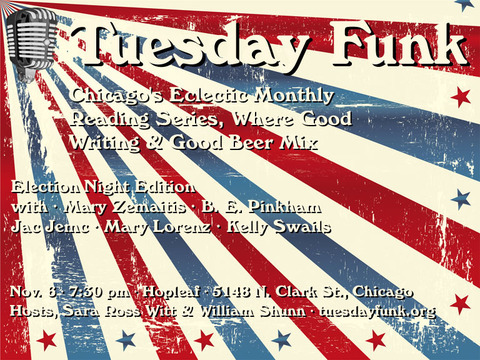 Please bring plenty of friends, and become a fan of Tuesday Funk on Facebook so you never miss an invitation to one of our readings. See you there! Illustration by Galen Dara. Used by permission. 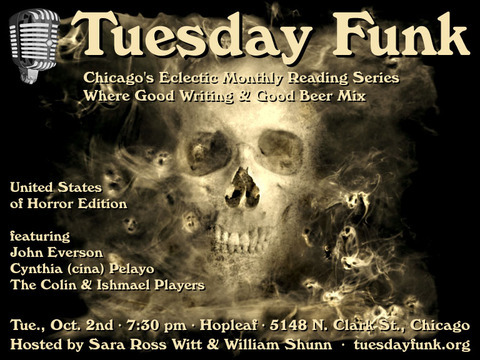 The evening gets underway with your co-hosts Sara Ross Witt and William Shunn on Tuesday, November 6th, 2012, 7:30 pm, in the upstairs lounge at the newly expanded and renovated Hopleaf, 5148 N. Clark St., Chicago. Arrive early for a seat, and grab a beer from Mark at the cash-only bar. We start seating at 7:00 pm and no earlier. Admission is always free, but you must be 21 or older. And come early or stay late after for some great Belgian-style food downstairs. That's change you can believe in. Please bring plenty of friends, and become a fan of Tuesday Funk on Facebook so you never miss an invitation to one of our readings. Remember, a win for Tuesday Funk is a win for America. The month of October. These United States. Our 50th big episode. Put them together and what do you get? Tuesday Funk's United States of Horror. No, it doesn't make any sense, but neither does life, and that's the whole point of the genre we celebrate in this shiveriest of months. Which is why, on October 2nd at Hopleaf, Tuesday Funk will present an evening of horror designed to scare the living daylights out of you. Our frighteningly good lineup that night will include John Everson, Cynthia (cina) Pelayo, and a special dramatic reading by The Colin & Ishmael Players, not to mention your pick of dozens of varieties of cold beer at the bar. 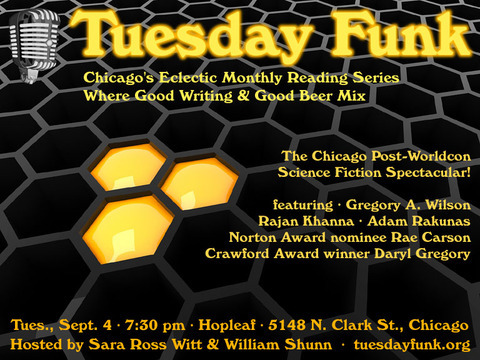 The evening gets underway with your co-hosts Sara Ross Witt and William Shunn on Tuesday, September 4th, 2012, 7:30 pm, in the upstairs lounge at the newly expanded and renovated Hopleaf, 5148 N. Clark St., Chicago. Arrive early for a seat, and grab a beer from Mark at the cash-only bar. We start seating at 7:00 pm and no earlier. Admission is always free, but you must be 21 or older. And come early or stay late after for some great Belgian-style food downstairs. Please bring plenty of friends, and become a fan of Tuesday Funk on Facebook so you never miss an invitation to one of our readings. We dare you. Tuesday Funk is proud and excited that the 70th World Science Fiction Convention will be coming to Chicago in three short weeks! 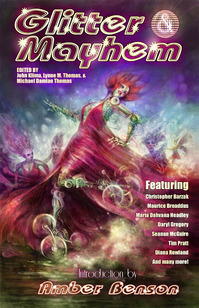 And It so happens that our 48th big reading will take place Tuesday, September 4th, 2012, the day after Worldcon ends. In honor of Worldcon, we plan to put on an evening of great science fiction readingsa veritable Science Fiction Spectacularwith a group of terrific writers we wouldn't normally be able to assemble here in Chicago. Our stellar lineup that night will include Crawford Award winner Daryl Gregory, Norton and Morris Award nominee Rae Carson, Rajan Khanna, Adam Rakunas, and Gregory A. Wilson! You'll also get a new Poem By Bill, not to mention your pick of dozens of varieties of cold beer at the bar. 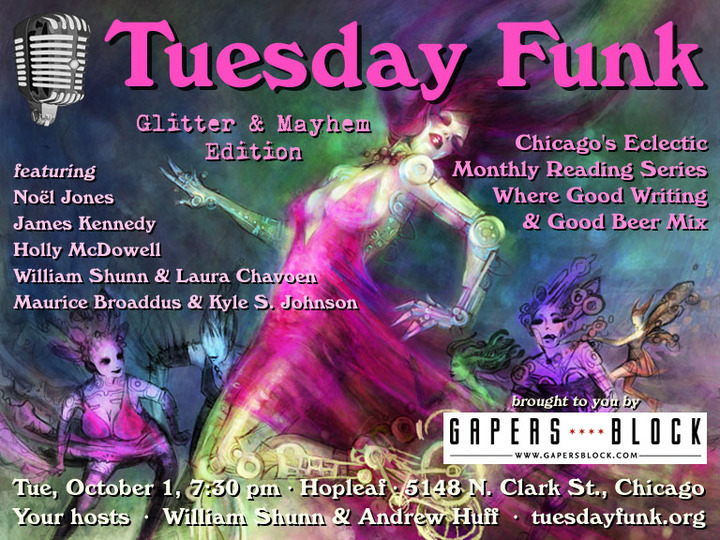 Please bring plenty of friends, and become a fan of Tuesday Funk on Facebook so you never miss an invitation to one of our readings. Dare we say they're always out of this world? Hold the hyperspatial presses! To celebrate June and July, Tuesday Funk is bringing you one out-of-this-world evening on one very special date. 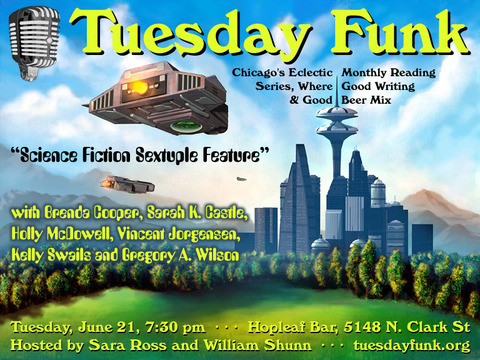 Our "Science Fiction Sextuple Feature" will take place June 21st at Hopleaf Bar, and will feature science fiction and fantasy writers from Funk alum Brad Beaulieu's Wellspring Workshop. Beam on up for readings from the likes of Brenda Cooper, Sarah K. Castle, Holly McDowell, Vincent Jorgensen, Kelly Swails and Gregory A. Wilson, not to mention a Poem By Bill. And don't forget the beereighty varieties of it upstairs alone! We dare you to find a better selection in the solar system. Tuesday Funk convenes Tuesday, June 21, 2011, 7:30 pm, in the upstairs lounge at Hopleaf, 5148 N. Clark St., Chicago. Arrive early, stake out a table in the upper room, and grab a beer from John at the cash-only bar. We start seating at 7:00 pm and no earlier. Admission is always free, but you must be 21 or older. And come early or stay afterward for some great Belgian-style food downstairs. Please bring plenty of friends, and become a fan of Tuesday Funk on Facebook so you never miss an invitation to our readings, which in future months will feature the likes of Julie Rosenthal, Karen Skalitzky, Eden M. Robins, Jerry Schwartz, Sondra Morin, and some big, big surprises. The new year always takes a few weeks to get rolling right, right? 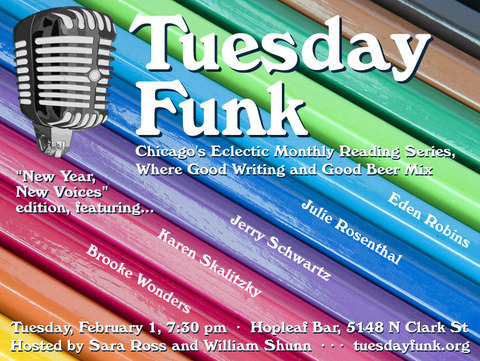 So join Tuesday Funk in February as we celebrate 2011 with our "New Year, New Voices" edition, bringing you great debut readings from Eden Robins, Julie Rosenthal, Jerry Schwartz, Karen Skalitzky and Brooke Wonders, plus our patented Poem By Bill. Oh, and there is beer, too80 different types of it. Resolve to be there! Tuesday Funk convenes Tuesday, February 1, 2011, 7:30 pm, in the upstairs lounge at Hopleaf, 5148 N. Clark St., Chicago. Arrive early, stake out a table in the upper room, and grab a beer from John at the cash-only bar. We start seating at 7:00 pm and no earlier. Admission is always free, but you must be 21 or older. And come early or stay afterward for some great Belgian-style food downstairs! Please bring plenty of friends, and become a fan of Tuesday Funk on Facebook so you never miss an invitation to our readings. And watch this space over the next couple of weeks for spotlight posts about our readers. This page is an archive of recent entries in the Themes category. Submissions is the previous category. Venues is the next category.